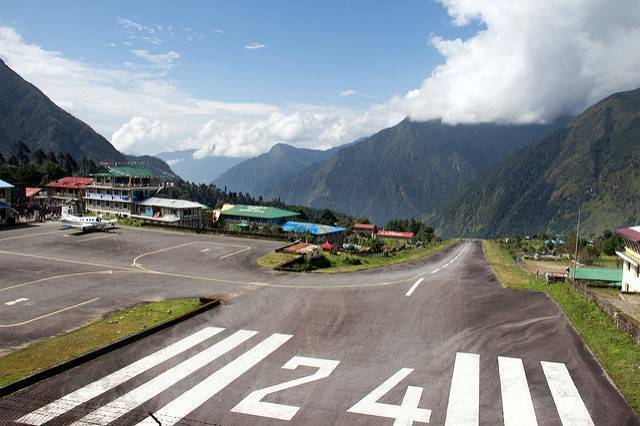 Lukla is a village in Khumbu and home to the region's sole airport. This sizable little village sits on a ridge over the Dudh Kosi River. Many shops, restaurants, tea houses, and a few bars could be discovered along and off the main trail through the village. Lukla is the main base for trekkers and climbers to begin their attack towards Everest. Of course the most fascinating aspect of Lukla may be the Tenzing-Hillary Airport by which the majority tourists comes and go. An experience in and of itself, this enormously short and slanting airstrip is extremely active every morning. Lukla has developed rapidly with the opening of its airstrip, which has made the Everest region available to many people and not just the mountaineers. Once a miniature farming community, Lukla is now a big trekkers town, with numerous lodging options (most fairly simple), many shops; selling everything from batteries and soap to yak hair gloves jackets, and even a couple of internet cafes. Right crossways from the entrance to the airport there is an outstanding German bakery that serves a yummy "apple cheese cake", all along with very good coffee.